Having been around the block more times than we can remember, suffice it to say it takes a lot to get us excited about a VoIP provider. Let us tick off some criteria to even get our attention: terrific pricing, failsafe reliability, and first class performance. So just imagine our excitement to discover that an early follower of Nerd Vittles now provides one of the most compelling VoIP services we’ve ever tested with triple redundancy in multiple data centers. And Skyetel now has added what, for some, was the most important piece: support for VoIP servers with dynamic IP addresses. While it’s still beta code, it’s easy to use and reliable. There’s yet another hidden benefit. Incredible PBX coupled with Skyetel makes a perfect platform for redundant servers. We’ll cover it in a future article, but here’s the basic design. Let’s sweeten the pot a bit more. We were looking for a service provider that could offer a compelling price for the hobbyist and home user while also having the depth to provide millions of minutes to organizations and resellers that actually have such a need. If you like BOGO deals at your favorite grocery store, then you won’t want to miss Skyetel’s new BOGO offer. Starting April 1, Skyetel will match your original deposit up to $250. Deposit $50 and Skyetel will double it. Or plan ahead with a $250 deposit and Skyetel will still double it. That translates into $500 of half-price VoIP service! On top of that, Skyetel will provide free porting of your DIDs for the first 60 days after you open your account plus a 10% reduction in your current origination rate and DID costs by presenting your last month’s bill.1 For many, the BOGO offer will buy you years of half-price VoIP service compliments of Nerd Vittles. For resellers and high volume users, document your requirements on your Nerd Vittles signup form and let us put you in touch with someone at Skyetel that will make you a deal you can’t refuse. And what does Nerd Vittles get out of this? Glad you asked. We’re delighted to have Skyetel as a platinum sponsor to keep the lights burning and the deals flowing for another decade of articles and open source offerings for our dedicated followers. We want to also address the elephant in the room. Some have asked about our relationship with Vitelity, a long time sponsor of Nerd Vittles and our open source projects. They’re alive and well. However, the company has gone through several acquisitions in the past few years, and their focus now has shifted more to the reseller and wholesale market. ALL EXISTING VITELITY CUSTOMERS ARE UNAFFECTED BY THIS CHANGE IN DIRECTION. And we are more than happy to put new resellers and wholesalers in touch with someone at Vitelity that can address your requirements. The good news is that you’ll now have two companies to compare while new home users and small businesses have a viable alternative moving forward. Because Skyetel’s system architecture is radically different from most other VoIP providers, we wanted to spend a minute documenting their setup. Typically, a VoIP provider may offer a failover server in case their primary server fails. But all calls flow through the primary server unless there is a system failure. As we noted previously, Skyetel’s current setup includes three redundant data centers, all of which receive incoming calls while being firewalled from each other. Once you place or receive a call from the Skyetel network, their data center is completely removed from the audio path of the call which flows directly between your server and the outside party. Thus, even if the data center experienced a total system failure in the middle of your call, neither you nor the other party would ever know it. This design also eliminates the potential of a man-in-the-middle attack from your VoIP provider’s server. This summary is not intended to be an exhaustive listing of all Skyetel services. Follow this link for a complete summary of fees and services. Traditional DIDs are $1 per month. Toll free numbers an additional 20¢ per month. Outbound conversational calls are $0.012 per minute. DIDs can be SMS/MMS enabled for 10¢ per month. E911 service is $1.50 per month. Incoming conversational calls are a penny a minute. CallerID lookups are $0.004 per call. Voicemail transcription is available for 10¢ per message. So here’s the drill to sign up for Skyetel service and take advantage of the Nerd Vittles specials. First, complete the Prequalification Form here. You then will be provided a link to the Skyetel site to complete your registration. Once you have registered on the Skyetel site and your account has been activated, open a support ticket and request the BOGO credit for your account by referencing the Nerd Vittles special offer. Greed will get you nowhere. Credit is limited to one per person/company/address/location. If you want to take advantage of the 10% discount on your current service, open another ticket and attach a copy of your last month’s bill. See footnote 1 for the fine print. If you have high call volume requirements, document these in your Prequalification Form, and we will be in touch. Easy Peasy! For those that may be concerned that one day, after your credit expires, you could be paying a penny a minute for phone calls, let me provide a little Ma Bell history lesson for you. When my roommate and I were in law school, our typical phone bill often exceeded $200 a month because we both had girlfriends a couple hundred miles up the road. In today’s dollars, that phone bill translates into roughly $1,200 a month. That would have been 120,000 minutes a month at a penny a minute in today’s dollars. So, yes, VoIP is having a profound influence on the AT&T and Verizon Bell Sisters. NOTE: If your PBX is sitting behind a NAT-based router, then you will also need to forward UDP port 5060 from your router to the internal IP address of your PBX. Otherwise, incoming calls from Skyetel will fail. You also may need to add a NAT=yes entry to each of the Skyetel trunk configurations using the GUI. The telltale sign that the NAT entry is required will be incoming calls with one-way or no audio. 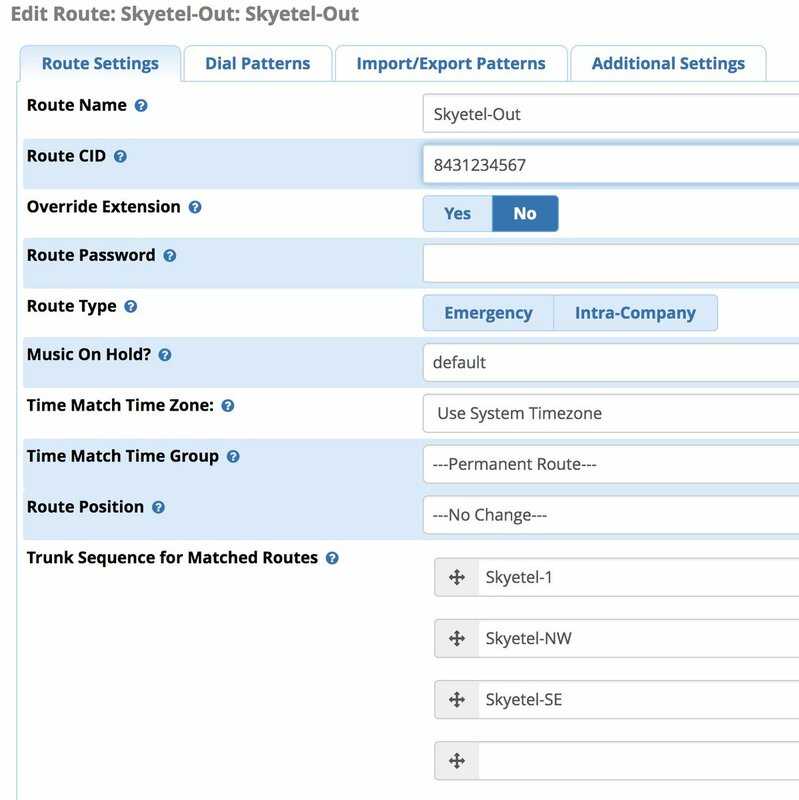 Because Skyetel uses multiple data centers without trunk registrations, you’ll actually need to configure 6 separate Skyetel trunks in the Incredible PBX GUI. The same setup applies for those using generic FreePBX aggregations. We’ve created a script to create all of the trunks for you. Just issue the following commands. The last command assures that you don’t accidentally run the script a second time which would cause all sorts of issues. Feel free to review the code if you want to learn how to create trunks in FreePBX from the command line. Next we need to tell your PBX how to route incoming calls from Skyetel. Using a browser, log into the IP address of your PBX using your admin credentials. Because there is no trunk registration with Skyetel trunks, you will need to create an Inbound Route for every Skyetel DID. You cannot rely upon a Default inbound route because FreePBX treats the calls as blocked anonymous calls without an Inbound Route pointing to the 11-digit number of each Skyetel DID. From the GUI, choose Connectivity -> Inbound Routes -> Add Inbound Route. 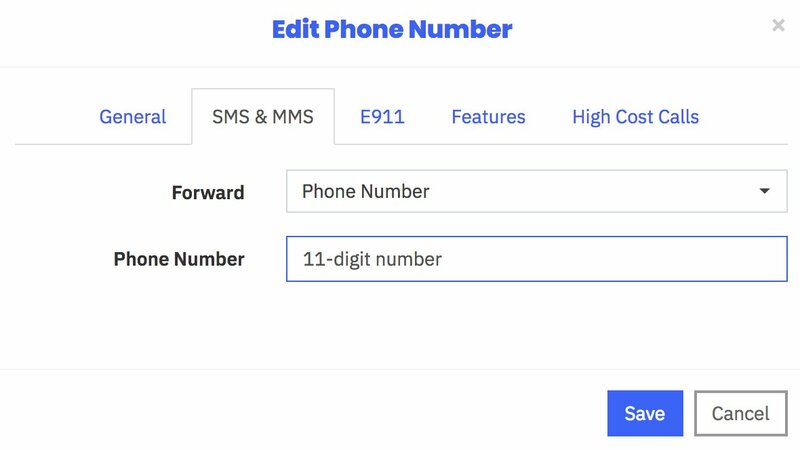 For both the Description and DID fields, enter the 11-digit phone number beginning with a 1. Set the Destination for the incoming DID as desired and click Submit. Reload the Dialplan when prompted. Place a test call to each of your DIDs after configuring the Inbound Routes. (1) Log in to your Skyetel portal and Add a New Endpoint Group for your server giving it the name and current public IP address of your server. (2) While still logged in, tap the Gear icon to open Settings dialog and choose API Keys tab. (3) Add a new API key and write down your new SID and SID password. (4) If your server is behind a router or firewall, log into that device and map UDP 5060 and UDP 10000-20000 to the private LAN address of your server. (6) Fill in your credentials when prompted, and the cron script will be installed to keep your server’s dynamic IP address registered with Skyetel. Enjoy! Skyetel seems great for anyone with a static IP address. Does Skyetel provide a means for dynamic endpoint registration for those with dynamic IP service from their ISP? I’m able to make and receive calls with Skyetel, but I have no audio on any of the calls. I’ve set my NAT parameters (asterisk is behind my firewall) globally as well as on the Skyetel trunks. In addition to no audio, when I terminate a call from either end of the call, the other end is not aware the call is terminated. Any thoughts? I’ve also searched on the PIAF forums, and have seen someone ask the question, but with no responses as of yet. So far, so good, sure appreciate the help! It may be worth mentioning that in some cases you may need to go into Applications -> Extensions and change the Outbound CID to your new Skyetel (or other) phone number. I forgot to do this initially, and my calls were still displaying my old Google Voice (R.I.P.) number. PJSIP trunks are configured for Google Voice, but not for Skyetel. But when I try to do the PJSIP fix linked above, I don’t find an "allow reload" option. Where should I go from here? Hi Ward, Thanks for the article. I tried Skyetel and it works great. It seems, It works particularly well with fusionpbx. Would love to have an article from you on how to setup Skyetel with fusionpbx. Also eagerly awaiting part II of Kamailio. Any idea if Skyetel plans to support 3CX systems? Thanks for all your work!